As more and more people are searching for Perk TV reviews on the internet, I decided to test this platform and give my honest opinion about it. Is Perk legit or another sneaky scam? You may also want to check out the step-by-step training that helped me reach $1,000+ per month working from my laptop (no special skills required). 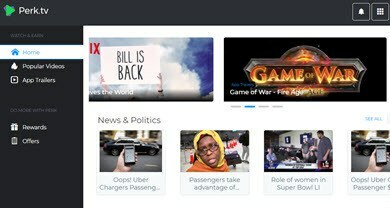 Perk TV is a website and app that allows users to watch entertaining videos in exchange for Perk points. The company also operates Perk.com and many popular apps such as Viggle, Perk Scratch & Win, Perk Pop Quiz and a few others. Viggle can also be accessed via Viggle.tv on your desktop and is almost identical to Perk.tv, except it has different video categories. You can use these all these platforms/apps to collect Perk points on the same account and redeem for Gift Cards and PayPal. RECOMMENDED: Click here to see my no.1 recommendation for making money online (build your own internet business and reach a full-time income online). No, it isn’t. I am confident Perk TV is a legit platform, but there is something very important you should know before you join! You can sign up and earn points, but you won’t be able to redeem for any reward unless you live in the United States, Canada (excluding Quebec), New Zealand or Australia. I send them an email, and they confirmed that my account here in the UK will be deleted on April 8th due to GDPR regulations. I believe thousands of people around the world waste their time collecting Perk Points without knowing they won’t be rewarded. This is not good! Another important thing you should know is that if you don’t earn any points within 30 days, your account will be deemed inactive and you will lose everything. Earn easy money by watching videos. You can use Perk.com and other apps to collect more Perk Points. Perk TV is also available as an app for both iOS and Android devices. The pay rate is extremely low. Rewards are only given to residents in the U.S., Canada (excluding Quebec), Australia and New Zealand. If you don’t earn any points within 30 days, your account will become inactive, and you will lose all your points. Perk TV is available both as a website (Perk.tv) or as an app that you can download via the App Store (iOS) or Google Play (Android). You can sign up for free using your either your Facebook or email address. Remember, you can only claim your reward if you live in the U.S., Canada (except Quebec), New Zealand or Australia. 1000 Perk Points used to be equal to $1 in the beginning. However, the value dropped significantly, so now you need 9,000 Perk Points to redeem $5 via PayPal. That means 1,000 points makes you $0,50 richer. WOW! Well, don’t get overexcited because as you will see, Perk’s earning potential is extremely low! It used to be better though, but in the last 2 years, the number of points has decreased significantly. How to Earn Perk Points? 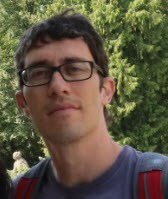 As the name suggests, the primary way to earn Perk points using Perk.tv is by watching videos. 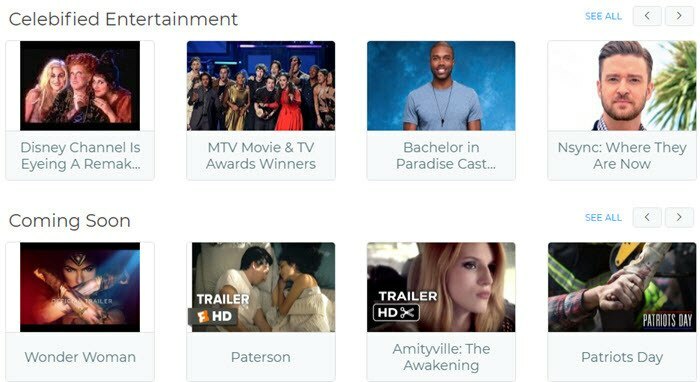 There are many video categories you can choose including News & Politics, Coming Soon, Netflix Trailers, Celebrity News and more! All you have to do is click on the video category of your choice and keep the tab open. The good news is there is no need to watch the video. In fact, many people keep multiple videos in many devices playing at the same time. That’s 100% passive income! I was researching on Reddit and found many users using more than 5 devices at once! Beware though that Perk can flag your account as fraudulent if they consider you are earning too many points in a short time. As a result, they will ban your account, and you will lose all your points. How many is too many no one knows! The company isn’t clear about how many videos you can play or how many points you can earn in a given period. Many people don’t care and keep playing multiple videos for as long as the Perk TV allows them. How Much Can You Earn With Perk TV? Well, it depends on how many videos you are playing at the same time. There is no rule, but if you keep just one tab open, you can expect to earn 1 point for every 5-20 videos. Each video takes approximately 2 – 3 minutes. Sometimes you can watch more than 10 videos without getting any points. That is very common! I was checking some Reddit threads about Perk TV and saw some discouraging comments. For example, 2 years ago, one guy claimed that he made 26 points in 1 hour using 4 phones! That’s not even 2 cents per hour, folks! I left Perk TV running in the background while I was writing this review and to my surprise, I didn’t get any point! A Better Way to Earn Perk Points Watching Videos! In my opinion, you are better off playing videos from Hideout.tv via the Adscend offerwall. You need to sign up to Hideout.tv and then link to your Perk Account via the link called Loyalty Program Rewards as you can see in the screenshot below. The only way to earn a decent number of Perk Points to cash out while you are still alive (irony) is by completing offers. 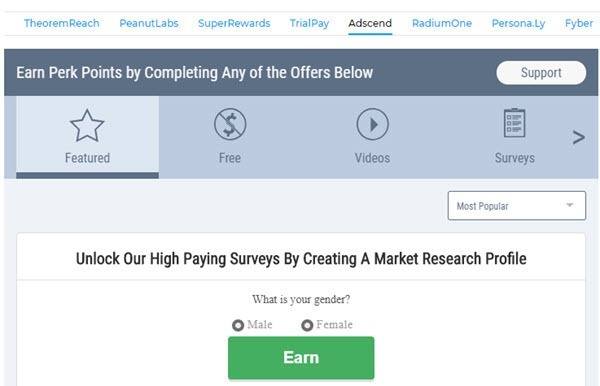 When you click on Offers, you will be directed to Perk.com, which provides well-known offer walls such as Peanutlabs, SuperRewards, Adsend, OfferToro, among others. Not only you can complete different offers but also take online survey worth anywhere from 100 to 800 Perk Points. The problem with surveys is that you won’t qualify for every marketing study, so you will probably waste a lot of time. Perk’s referral program is unclear as to how much you will earn for inviting other people to join under your link. I don’t know why they prefer to omit this information. They say you can earn up to $10 per referral, which in my opinion is too bad! In contrast, Prizerebel pays 20 up to 30% commission on all your referral’s earnings FOR LIFE! I have been using Prizerebel for more than 2 years, and I usually make $150 – $200 per month in referral commissions. Click here and discover the training program that showed me how to grow a large audience online and earn passive income with lots of referrals. You can redeem Perk Points for PayPal cash as well as a wide range of gift cards from popular stores such as Amazon, Best Buy, Wallmart, and many others! Currently, the minimum payout is $0.25 (350 Perk Points) through Amazon gift card. Also, you can exchange Points for Tokens to buy entries for prize draws. Perk TV is a legit website, but the income potential is incredibly low! 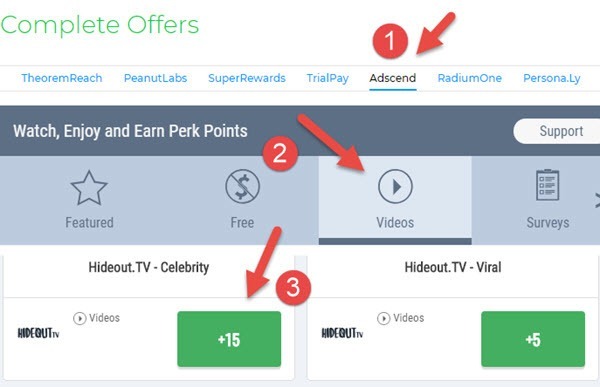 If you want to earn more Perk Points when watching videos, I advise you to use Hideout.tv via the Adscend offer wall. Also, completing offer and surveys through Perk.com can help you reach the minimum cashout amount much faster than just watching videos. Have you even though about making $100s and even $1,000s from the comfort of your home or while travelling the world? Well, many internet marketers can earn a full-time income because they have built an online presence over time! 2015 was the turning point in my life when I discovered this excellent step by step program, which gave me the proper education to build an internet business. After creating content for my own website during the last 3 years, I reached over $1,000/mo in affiliate commissions! 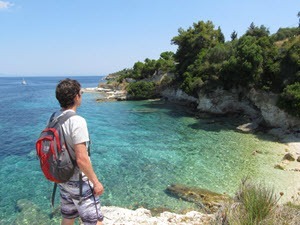 I am not rich, I know, but this extra online income has given me significant freedom! Keep in mind that this type of business takes time and commitment, so you should not expect overnight results. If you want to learn more about this program and how it can help you achieve your goals, check out my #1 recommendation review here.